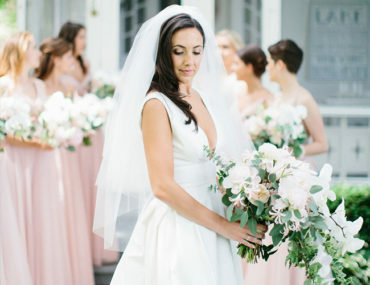 Are there any brides out there looking for the ultimate style inspiration? Look no further than bridal designer Emily Kotarski and her groom’s Charleston engagement photos! 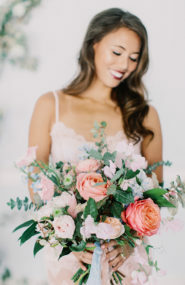 She donned three of her own designs for the gorgeous shoot; a sleek silk black dress, a long sleeved floral number, and a blush ball gown with lace applique. 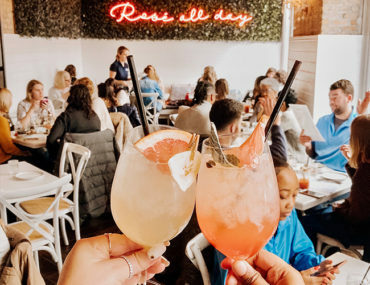 And for each one of the feminine styles, there was a different setting on the Southern estate to match; from a tandem bike ride, to an intimate picnic, to sunset on the dock. 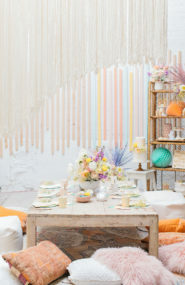 Below, Emily shares just how special the session was and why they picked the stunning location. 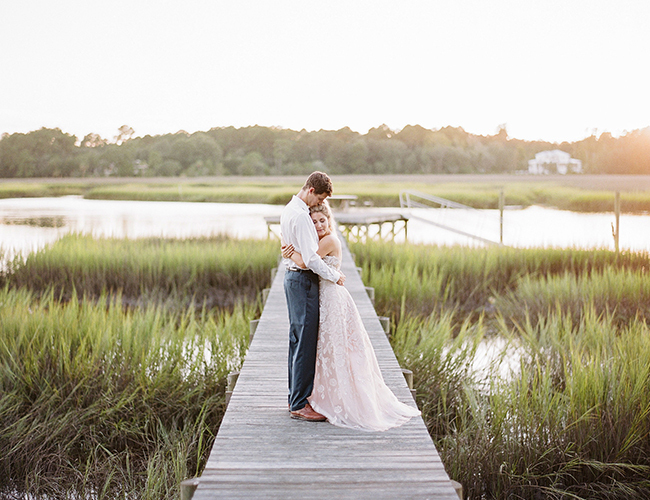 Emily says, Drayt and I moved to the beautiful city of Charleston, SC in January of 2016 in order to pursue the launch of my custom bridal gown business in the heart of the Southern wedding world. We knew that after choosing to get married back home in Philadelphia that we wanted to share a taste of what we love so much about our Southern surroundings in our engagement pictures. 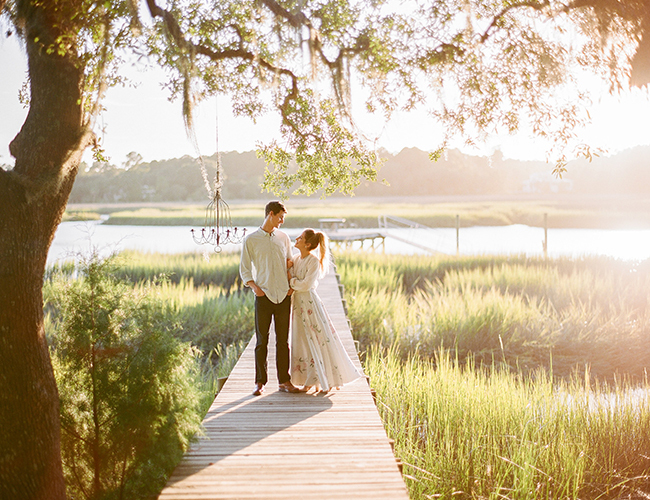 River Oaks is a beautiful property with stunning backdrops that perfectly showcase the beauty of Charleston. In front of the European style house was as the perfect place for Drayt and I to rode the same tandem bicycle that we used to ride from his parents home along a Pennsylvania trail when we first started dating. Here, we also walked and showed our spunky Morkie, Tompkin, some love because he is also such an important part of our little family. 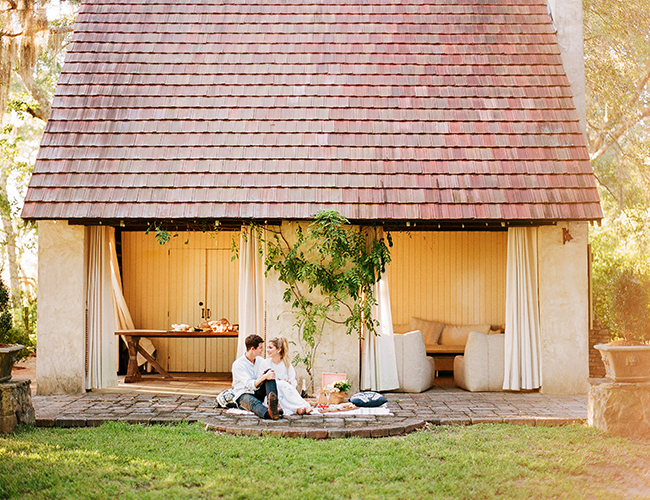 Around the back of the property you will find a quaint, open air cabana where we then shared a picnic and celebrated with champagne. The jaw dropping views of the river front dock is where we ended the night as another beautiful Lowcountry sun set around us in hues of pinks, yellows and blues. We look forward to reminiscing on this day as an engaged couple in our beautiful Southern city, and ahead to celebrating our wedding day with loved ones in another city we love, 700 miles north, as we ring in the New Year, 2020. I chose 3 gowns from my new collection, “Alfresco,” to wear throughout the night which were all inspired from the beautiful floral surroundings of Charleston. 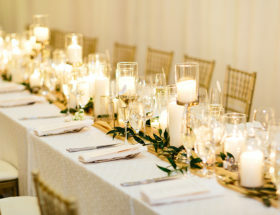 This is only a little taste of the looks to come for my own special day…because after all, what does a bridal gown designer design to wear to her own wedding? These dresses are just too good! And the venue is pretty perfect!